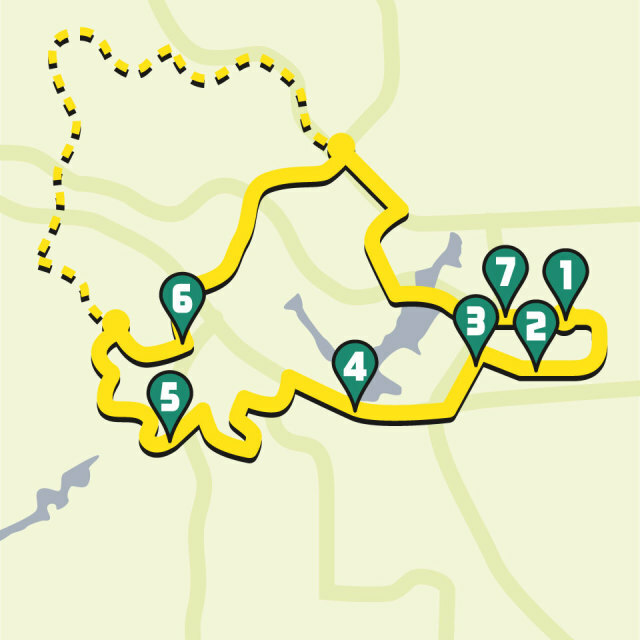 These routes will get you started, plus food, drink and entertainment ideas along the way. Start at 1) Cleveland Park in Rice Military. Take the pedestrian bridge over Memorial Dr. into 2) Buffalo Bayou Park, turning left onto the north side of the bayou. Cross over the Rosemont pedestrian bridge and rest while checking out the 3) “Tolerance” statues. Continue east along the south side of the bayou—carefully crossing the streets that feed into Allen Pkwy.—until you reach Lamar St. near 4) Sam Houston Park. 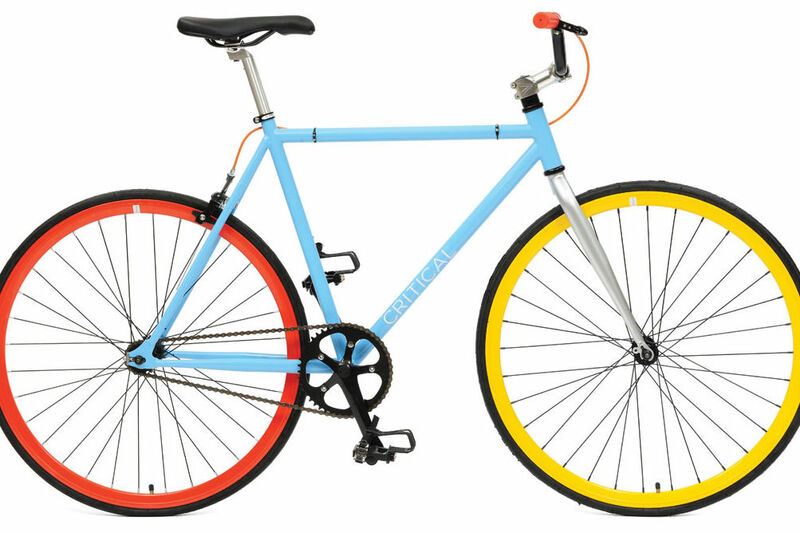 Continue in the Lamar bike lane to 5) Phoenicia to buy supplies for a picnic in 6) Discovery Green. Return via the same route, crossing the bayou at Sabine St. and riding west along the more scenic north-side trail, or if you happen to be there around dusk, along the southern side so you can watch the 7) Waugh bridge bat colony emerge before returning to Cleveland Park. Not tired? Double your journey: head south on Caroline St. from Discovery Green and enjoy a drink at 8) 13 Celsius or tour 9) the Museum District. Start downtown at 1) Market Square Park. 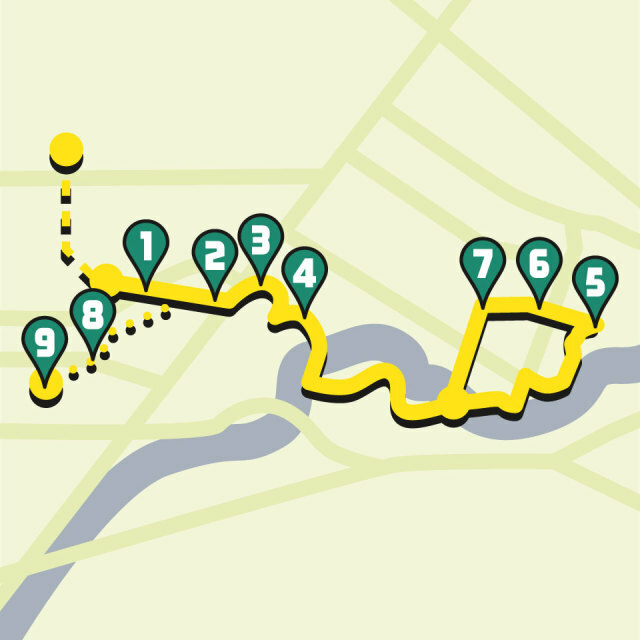 Take Travis St. north, turn right on Franklin St. and left on San Jacinto St. After passing the Harris County Jail, turn left onto the Heights bike trail and follow it past 2) UH-Downtown, keeping right at the fork to follow the route along White Oak Bayou to 3) Stude Park. 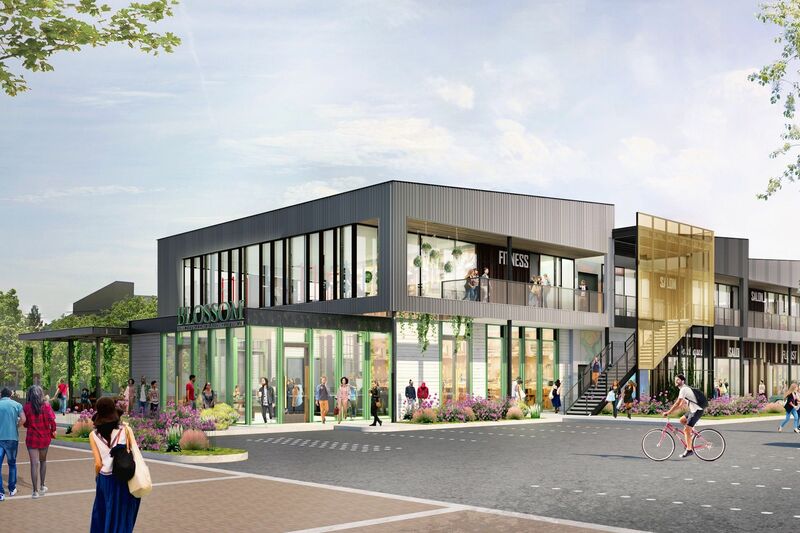 Take White Oak Dr. to grab food and drinks at 4) Onion Creek or 5) Christian’s Tailgate, the latter of which offers cyclists a 20 percent discount on food. Continue west on White Oak and take a right onto the Heights Trail (just after Oxford St.). Turn right onto Nicholson St. and take the trail there north to 6) historic 19th St. to shop, eat or grab some caffeine from Boomtown Coffee. Head east on 19th, turning right onto idyllic Heights Blvd. before reconnecting onto the Heights Bike Trail at 7th St. and heading back downtown. Not tired? 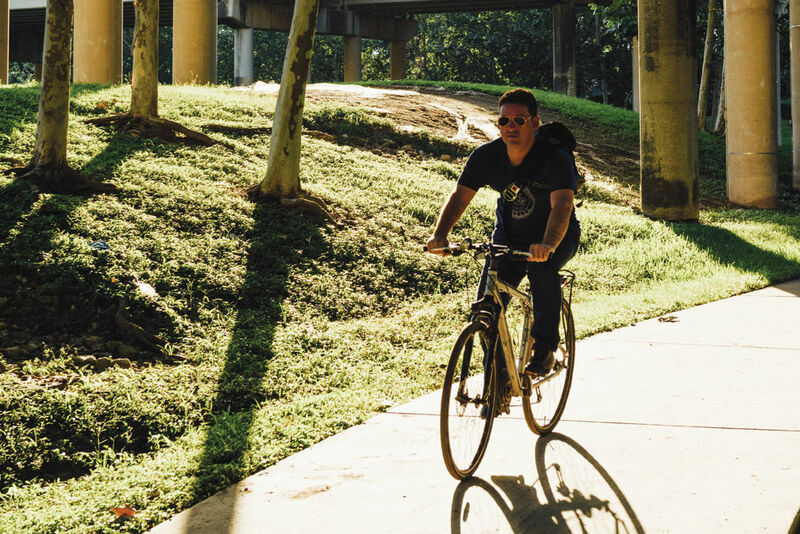 Add seven miles to your trip by skipping the Nicholson Trail, instead continuing northwest on the Heights Bike Trail via TC Jester Blvd. to the White Oak Trail. Turn right on 34th St., taking the bike lane to Golf Dr. before stopping for burgers or beer at 7) Petrol Station. From 1) Rice University, cross into 2) Hermann Park via Sunset Blvd. 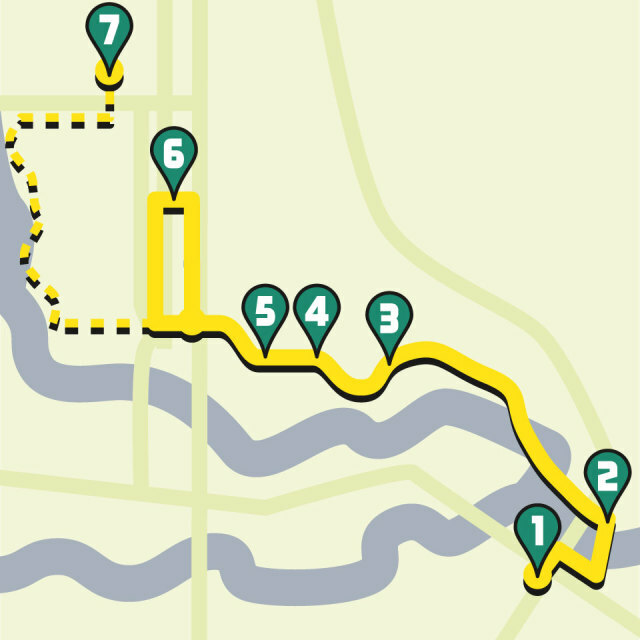 Once inside, follow the perimeter trail past the 3) Sam Houston Monument and 4) Miller Outdoor Theatre before crossing Hermann Park Dr. towards the Marvin Taylor Exercise Trail. 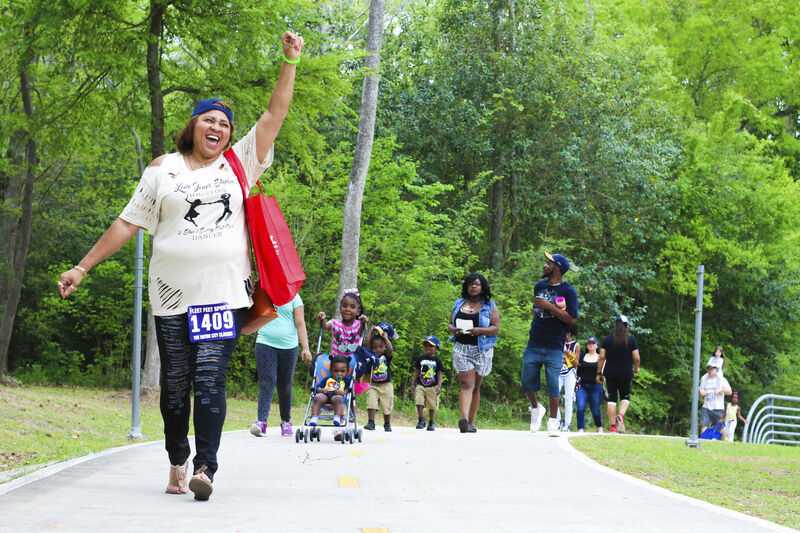 Follow the trail around the golf course, then turn onto Brays Bayou Trail and cross Almeda Rd. at S. MacGregor Way and head east along the bayou’s south side. Continue all the way to Scott St., then cross to the north side of the bayou and continue eastbound until you get to Cullen Blvd. 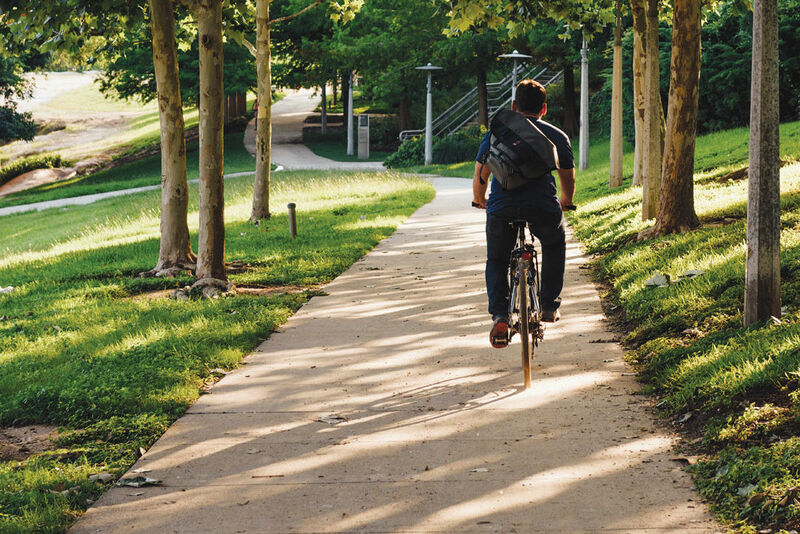 Make a left there and ride to 5) the University of Houston where you can take a breather, perhaps by enjoying some theater or attending a sporting event. Grab a drink at The Den or head west on Wheeler St. and south on Scott to pick up some of 6) Frenchy’s famous fried chicken. 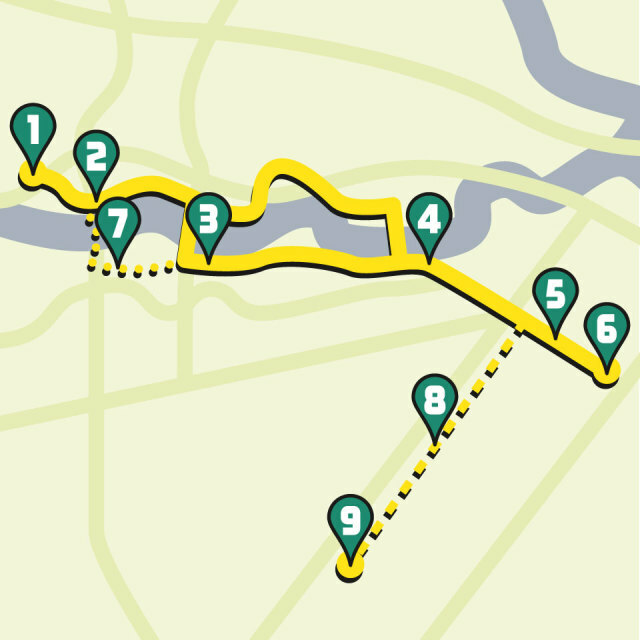 From there, continue west on Wheeler to 7) Texas Southern University and tour the campus before heading south on Tierwester St. until it connects with the Brays Bayou Trail. From there take a right and continue back the same way you came. Once back at Rice, don’t forget to relax by, say, visiting the 8) James Turrell Skyspace or having a beer under the oaks outside 9) Valhalla. Not tired? From Rice, cross Sunset Blvd. and head north on Mandell St., cruising around the handsome mansions of Boulevard Oaks. 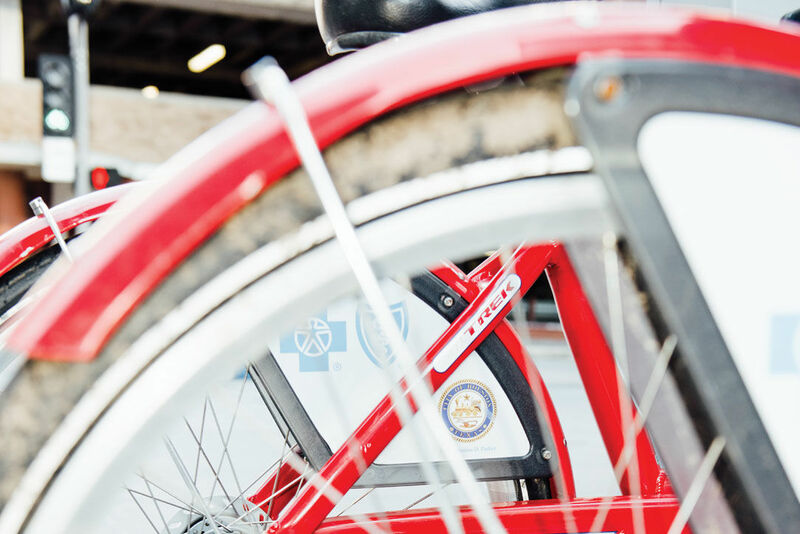 Start at 1) The Woodlands Mall and ride south along the Woodlands Waterway and west through Waterway Square, where you can grab a pizza at 2) Grimaldi’s or cross Six Pines Dr. for a performance at 3) the Cynthia Woods Mitchell Pavilion. Turn left at Grogan’s Mill Rd. and then right onto Woodlands Pkwy., moving from the feeder to the trail after passing Lake Front Circle. Instagram a pic of the Lake Woodlands serpent from 4) South Shore Park, then continue west before turning left on South Panther Creek. Turn right on Coralberry Rd. and right onto Tangle Brush Dr., then turn left and follow the trail along the greenbelt to Gosling Rd. Cross Gosling and pick up the dirt trail that meanders through the 5) George Mitchell Nature Preserve. From the Fitness Loop Trail, head north to connect to Flintridge Dr. and turn right, heading east. At Gosling, make a left and continue all the way to Research Forest. Grab a snack at 6) Hubbell & Hudson Kitchen, then head east on Research Forest Dr. before turning right to head south on New Trails Dr. Turn left onto Lake Woodlands Dr., cross the lake and continue to 7) Market St. for a well-deserved meal or drink just a short hop from your starting point. Not tired? For a more roundabout route to Research Forest, head left instead of right on Flintridge after leaving the Nature Preserve and take a right on John Cooper School Dr./Cochran’s Crossing Dr.
Houston BikeShare sets its sights on the Texas Medical Center. Not all two-wheelers are created equal. 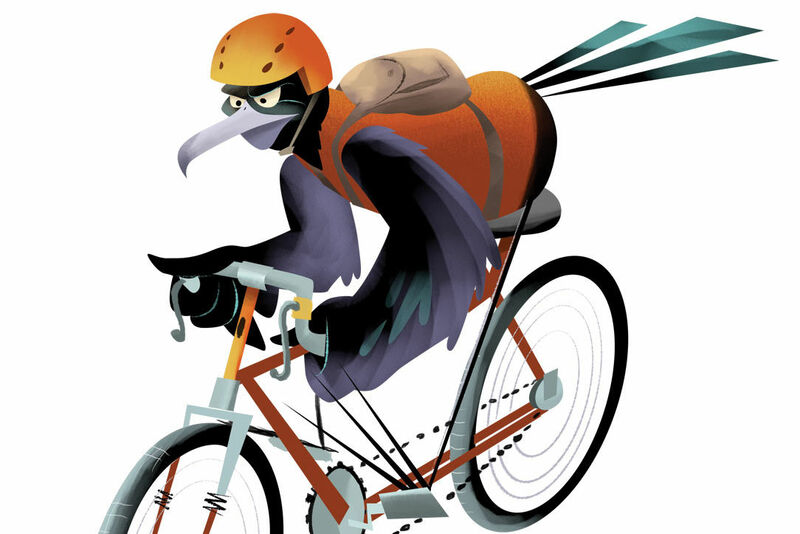 Here are seven options for every kind of cyclist. 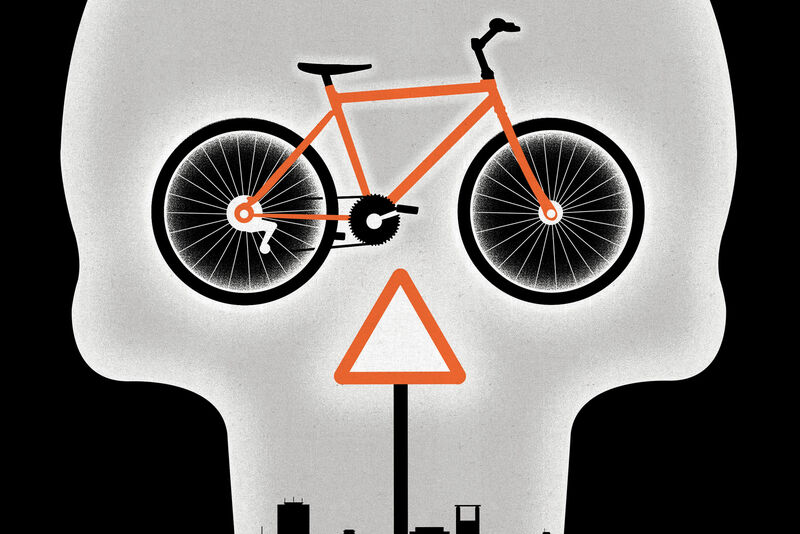 In a car-friendly city, cyclist-rights activists are demanding attention—and saving lives. 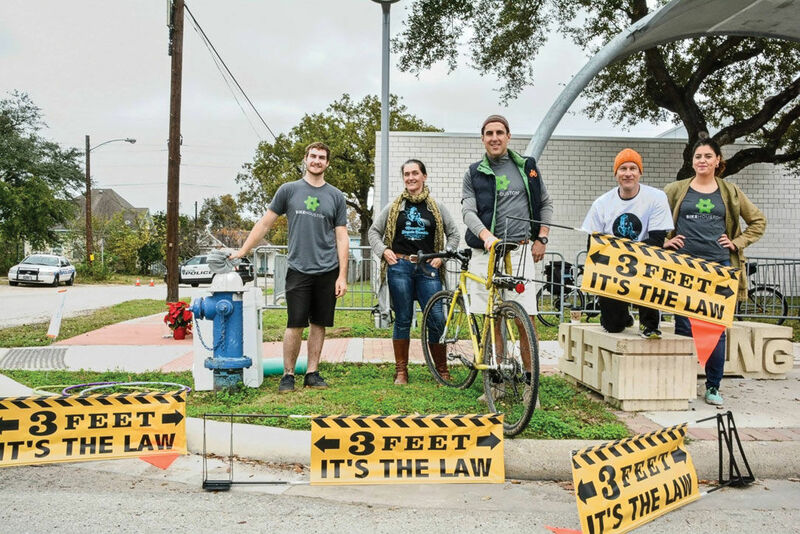 Braving Houston streets can be a daunting task for a new cyclist—fortunately, you’re not alone.